The Vietnamese Business Association in Russia convened its Congress for the 2018-2021 tenure in Moscow on December 1. Speaking at the event, Chairman of the association Le Truong Son said over the past three years, high-level meetings have opened up opportunities to consider clearing obstacles and new development possibilities for businesses. The enforcement of the free trade agreement between Vietnam and the Eurasian Economic Union has made it easier for Vietnamese firms to expand operations in Russia and the Commonwealth of Independent States. Additionally, Russia’s switch to seeking partners in Latin America and Asia, including Vietnam, especially trade of farm produce and key products, also brought opportunities to Vietnamese enterprises. Vietnamese firms working in apparel, farm produce production and supply in Russia are also well-positioned to grow, he said. Amid impacts of the western sanctions and falling consumption of key consumer goods, the association has worked to unite its members together, he said. The congress elected a new 15-strong executive board for the eighth tenure. 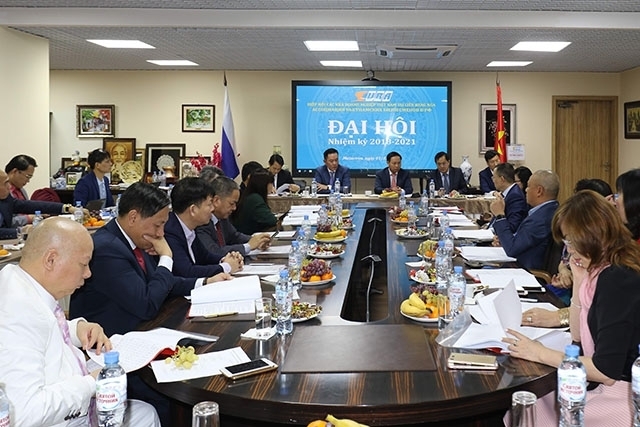 Vietnamese Ambassador to Russia Ngo Duc Manh lauded the association for creating jobs to tens of thousands of Vietnamese and Russian workers, contributing to socio-economic development in the host country. He suggested that it should offer more support to newly-established firms, hold seminars and events to introduce Vietnamese goods, and help Vietnamese citizens switch to new business models. Manh expressed his belief that the association and the Vietnamese business community will further thrive, becoming a highlight in Vietnam – Russia ties.